Well, Sony announced their third generation Sony Reader last night. There’s a lot to like about the new Sony Reader – PRS-700 – touch screen, LED for reading in bed or low-light conditions. (As an aside, can someone explain that type of numbered branding to me? 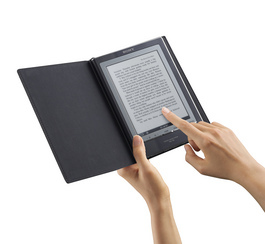 Why not call it Sony Reader 3, the Third, Sony Reader – the third chapter. Nope. We’re gonna name it the PRS-700). But, unfortunately, Sony is missing a key, vital, feature here – there’s no on-board wireless connectivity or built-in Wi-fi. Hence, the title of my post. To get content onto the Sony Reader PRS-700, you have to connect it to your computer. Until Sony incorporates wi-fi or built-in wireless for its 4th generation, they’re going to have a hard time competing with the Amazon Kindle. Sony is still struggling with content. Sure, they’re supporting ePub, PDF, and other formats. But, they’re still way behind the number of titles available for the Kindle. According to PW’s story today, Sony is planning to increase the number of titles availabe in the Sony Reader store to 100,000 titles from 50,000 now. However, that still puts them behind the Amazon Kindle by 80,000 titles. For competition’s sake, I’m excited by the touch features, the LED lighting, and the promised redesigned Sony eBook store. But to truly go head-to-head with Amazon, Sony has to incorporate wireless sooner rather than later.